You won’t find this anywhere else on earth. 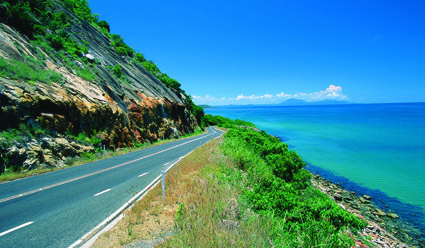 Two of the world’s greatest living treasures – the reef and the rainforest – meet on the Great Tropical Drive, which is divided into five sections: Northern, Western, Southern, Central and the Great Green Way. Loop north from Cairns to Cooktown via the Captain Cook Highway (right), then inland south through lush tropics and golden savannah to Charters Towers, before curving north again to the coast via Townsville. Rainforest spilling down mountainsides to meet the sea in a chain of magnificently deserted white beaches, cassowaries darting in and out, the loop through the jungley Atherton Tablelands – it’s a piece of Tropical Queensland most tourists don’t even know is there. Try some crocodile pie at Hartley’s Creek Crocodile Farm, 40km north of Cairns. Stay at some exquisite B&Bs and explore the hugely underrated Atherton Tablelands, as well as the gorgeous 15km Millaa Millaa Waterfall Circuit. Witness the “calling of the cards” at the historic Charter Towers stock exchange, established during the gold rush from 1872 to 1899. Hou Wang Temple in Atherton is all that remains of a once thriving Chinatown. The small timber and iron temple built in 1903 has somehow managed to survive, while all around it buildings were demolished and carted away for scrap. It’s still fitted out with the original elaborate carvings, bell and metal vessels brought from China. Guided tours run on demand. The new Australian Coffee Centre at Skybury’s coffee plantation near Mareeba runs guided plantation tours and also has a terrific cafe. Taste their delicious own-grown coffee on a deck with views that stretch forever.